Highlights of the meeting included strange, eight-inch Victor scroll records (right) from Japan brought that Glen brought in to share with the club. The final NESPRS meeting of 2018 spun out in Topsham, Maine on Sunday October 21. Both old and new business was discussed. We ate lunch and dinner together and listened to some mighty fine records. A particular treat was seeing some strange, eight-inch Victor scroll kiddie records from Japan. Glen brought them in and no one could ever remember seeing anything like them before. 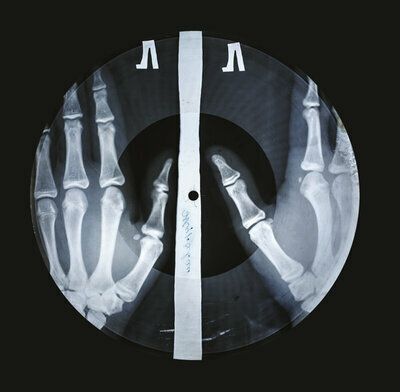 Both 10 and 12-inch scroll records are common but not so these eight-inchers. Victor issued a few 7-inch kiddie discs (singles and sets) during the depression era, but no 5-inch discs, to anyone’s knowledge. The 2019 club meeting schedule (pending a few confirmations) was penciled into the calendar. Club President Troy R. Bennett is on the hunt for east meeting locations. Club Librarian Spike Hyssong examines a record. Club Librarian and game master Spike Hyssong treated us to a wonderful Family Feud style trivia game. Most questions were answered correctly but Spike managed to stump the club’s collective wisdom a few times. For the record (ha!) Troy’s team beat Tony’s team this time — by two points. Glen (from left) Warren and Doug. That’s all for this year, folks. Have a wonderful winter of collecting and listening. We’ll see you all in April. Keep it tuned here through the cold weather for hot tips and cool tunes. The Great 78 Project is a community effort in the preservation, research and discovery of 78rpm records and cylinders. Thousands of records have already been digitized and preserved by the Internet Archive, George Blood LP, the Archive of Contemporary Music and others. The project brings all the collections together in one place on the internet. You can search by year, type of music or nearly any kind of metadata like artist, label or title. When you find what you’re looking for, you can listen for free. You can even download the music. You can also embed the music you find, like I did below. Click away and hear “You Ain’t Goin’ To Heaven No How” by Joe Liggins and his Honeydrippers from 1946 on Exclusive. This is a hot number! It’s listed here as Brunswick 81003. It was also released as Vocalion 1010. This side features Kid Ory on the trombone and Johnny St. Cyr on banjo. It features a great 78rpm record gag in the first couple minutes. I hope winter is treating you well and you’re snuggled up to a warm turntable, spinning those records you love. Plans are afoot for this year’s series of club meetings. The schedule is as follows. Mark your calendars. Details still need to be finalized but the east meetings will be somewhere in the Bath-Brunswick area of Maine and the west will be in the vicinity of Lebanon, NH. Watch this space for further developments. Spike checks through the ‘fore sale’ records during during the social hour — which really last two hours every meeting. That’s all for this year folks. Thanks for coming to the meetings. I had a great time and I know you did, too. Next year’s meeting schedule is posted just to the right –>. The venue for the Maine meetings will get ironed out over the winter. As you can see, all meetings will be on Sundays in 2017. We’ll also be working on an online club directory in the new year so we can all get a better idea of what we collect. That way, we can all be on the lookout for good records for each other. Starting in April 2017, we’ll have a door prize of $25 at every meeting to be used towards dinner, afterwards. Let’s shake the trees over the winter months and find some new members and also keep in touch with all our current ones through the cold and snowy days ahead. An unusual record label out off Massachusetts. Spike (left) and Warren share a laugh. David takes a closer look. Glen shows off a record with an extra hole. Do you know why? A Vogue picture disc that went at auction today. Henry had books for auction items at this meeting. Reading about records is almost as fun as listening to them. Western music may have been changing the world in the 1950s, but if you happened to be in Russia you were out of luck. State censorship was in full effect in the Soviet Union, and sneaking in, say, an American rock record was close to impossible. But a few industrious music fans managed to find another way. Stephen Coates, the leader of a British band called The Real Tuesday Weld, happened on this secret history by accident. Several years ago on a tour stop in St. Petersburg, he was strolling through a flea market when a strange item caught his eye.